Elon Musk's Boring Company Will Build High-Speed Train To Chicago's O'Hare Airport The train tunnel company will build and operate an "express service to transport people to O'Hare Airport from downtown in 12 minutes," Chicago Mayor Rahm Emanuel says. Chicago has selected Elon Musk's Boring Company to build and operate an "express service to transport people to O'Hare Airport from downtown in 12 minutes on electric vehicles in underground tunnels," Mayor Rahm Emanuel says. 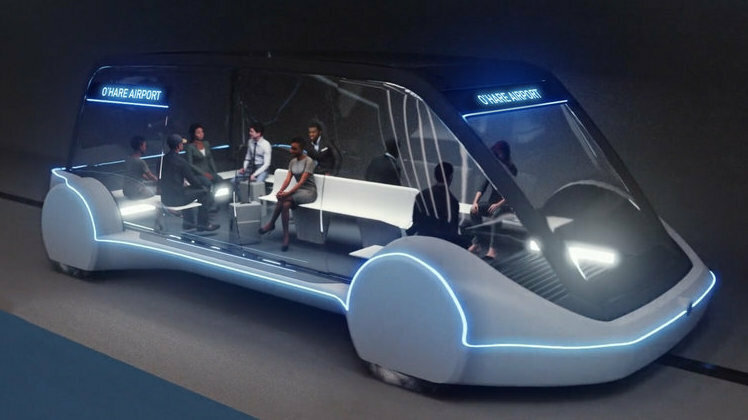 "We're really excited to work with the mayor and the city to bring this new high-speed public transportation system to Chicago," a Boring Company spokesman said as the company announced the news on Thursday. Currently, some 20,000 air travelers move between the airport and Chicago's central business district every day, according to the Chicago Infrastructure Trust. The agency adds that the figure is predicted to reach to at least 35,000 daily air passengers in 2045. The Boring Company says it would transport passengers "on autonomous electric skates traveling at 125-150 miles per hour," with each skate capable of carrying between 8 and 16 passengers. The skates would be based on Musk's Tesla Model X, and confined to a concrete track. The proposed route would run from the airport to central Chicago's Block 37 — a large venture in the Loop community that is also the site of a stalled super-station that was meant to use express trains to connect to the airport. The Block 37 station was a dream project for "former Mayor Richard M. Daley, who sunk $200 million into building a downtown station that never opened," member station WBEZ reported last fall, as it analyzed Emanuel's plan to resurrect the project. "The thought was, you can avoid having to relocate buildings and homes, and lots of complex relocation utility, by just digging deep and putting in a tubular type infrastructure that would allow trains to just zip to O'Hare in these pods that could get people there in 10 minutes or so," Joe Schwieterman, director of DePaul University's Chaddick Institute for Metropolitan Development, told WBEZ. "There's a lot of hype in that, but it's not yet been demonstrated worldwide." As for how much it would cost Chicago travelers to ride on the system, the Boring Company says that while it's not yet finalized, the fare "will be less than half the typical price of taxi/ride-share services," but higher than the city's Blue Line train from O'Hare — which currently costs $5, as a special fare. While many details of the Chicago project are not yet available, the plan resembles one that Musk has put forth for Los Angeles, where an 11-mile tunnel could shoot passengers between the city's downtown and the Los Angeles International Airport in around eight minutes.